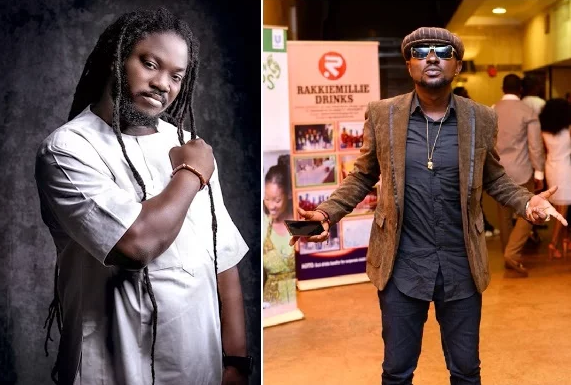 Veteran musician, Daddy Showkey has weighed into Blackface's recent interview where he expressed his dissatisfaction with lyrics and originality towards most Nigerian musicians including his former band member Tuface. Taking to Instagram to react, Daddy Showkey called out blackface and advised that he works on his craft and stop ranting like a kid. I don’t see why people like building issues out of nothing. What do you want Tuface to come and say about him and Blackface? O boy! You and your pulse tv, make Una go sleep if una no get something to talk. If you want to make peace, you don’t create war! You don’t call people out to start saying things about one and another. People try to make peace between people. You are trying to call tuface to come and say what? O boy! Make Una no make person vex oo!!! What do you really know about these two young men Do you know where they started from? @blackfacenaija let your music speak for you! Stop RANTING!!! It is high time you guys stop this childish behavior! You all are people’s fathers, you have children. I went through what @official2baba is going through and I know what jealousy can cause. I am not happy when I see young men that started together beefing each other. If you want help, there are so many ways to go about it and if you feel you can do it by yourself, go ahead! It is not until when you bring your brother man down that will make you be relevant. If you want to sing, sing oooo! Our work Na to make people happy! Not to make people sad. E be like say time don reach wey I go call all of Una together. Make Una stop blab blab! Blow blow and DO MUSIC!!! If small pikin they do music, e dey pepper you. Stay your own too Tuface! No answer anybody. I no wan hear you answer anybody. Everybody get him mouth to yarn him JagaJaga story. So, make Una stay Una own Abeg.